Auto Punditz – Page 50 – Not just another automotive website! Great Advertisements == Success in Sales??? There are some advertisements which are just FLAWLESS. Be it communication, execution or presentation – they just surpass the creative limits. Now the million dollar question arises – How does the product fare after the success of the ad?? Does it convert into a sales success story?? Does it leverage the impact it would created through its ad?? In Safari’s case its unfortunate – The product couldn’t perform as expected. 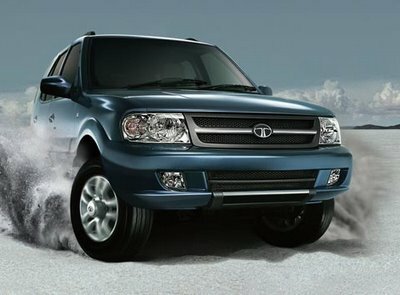 The ad did raise eyeballs, but awareness on Tata Safari’s part was minimal. The ad was successful in establishing connect with the audience, but at the same time it failed in creating the Brand / the Aura for the product. The ads’ message ‘Reclaim your life’ somehow didn’t click on the mass level for Safari. The purpose of the ad was to unleash Safari’s 4×4 and offroading capabilities; rather it communicated a message that was lot bigger than the product itself. However, this is a very debatable topic and would like my readers to comment on this and express their views. Even after the entry of stylish, elegant and contemporary models such as Beat, Figo, Polo, Micra, etc.. Maruti’s leadership position remained unshaken. And the reason??? ALTO!!! One of the oldest models of Maruti Suzuki, the Alto still is the bestselling car on the Indian roads. Auto analysts are stunned by the performance of the oldies such as Alto, Santro and Omni. These cars remain the highest number-churning models for their manufacturers. And this behavior is totally unexplainable in the dynamic Indian car market. Many say that Indian buyers will always choose the tried and tested cars in the market and hence don’t dare to experiment. But, Maruti never wanted to take chance with its fate. It knew that the competition in the lower A-segment category is gonna much stiffer after the launch of Nano, and the announcement of Hyundai planning its vehicle in this category made it more interesting. Even though Alto were doing its numbers well, Maruti HAD to respond to the demanding customers in this category. The customer in this category too has grown conscious in terms of style, features and attitude rather than just being focused on functionality. This facelift of Alto is an extremely intelligent decision and will act as a factor of delight for customers in this segment. The increased engine capacity will add to the delight and give more powers in the hands of the entry level customers. And the new peppy K—series engine will make Alto a car to ride on long distances too, rather than just turning it around the city. Logan loves India… But, does India loves Logan? M&M has come up with a new communication campaign for their sedan – ‘Logan loves India’. Logan is the most practical car in its category. Be it in terms of comfort, refinement or space; it just outpaces its competition. This joint venture by-product of Mahindra and Renault did a wonderful business at the start, but somehow couldn’t get a hold on the segment. Slowly Renault lost confidence on this untapped machine, (which I believe still has a lot of metal in it to break into the sales figures) and thus it decided to sell off its stake to Mahindra. Mahindra knew that it has to re-work its strategy and make up the lost time. M&M was very quiet in its Logan campaign right from the start. This was exactly anti-M&M, as Mahindra was always known to have one of the best launches in Automotive history (take launch of Scorpio or Xylo). People were quiet skeptical with the brand, because Renault was continuously tying up with several auto manufacturers (Bajaj & Ashok Leyland) and hence the doubt prevailed on constant supply of parts. The existence of cheaper alternatives in the form of Maruti Swift Dzire, Tata Indigo, Ford Ikon and Hyundai Accent further killed Renault’s sales. People were also dissatisfied with the looks of Logan and it amazed me that Mahindra-Renault didn’t even try to give a facelift in these 3 years..! Except the additional decals and paint job on the Tourer and Play variant, they didn’t try anything new. This further re-instated public skepticism on the brand. In the mean time the owners of Logan were extremely happy with the product offering. Majority of them being taxi drivers accepted the product with open arms as it provided best in-class rear leg room and the same time had the biggest boot in its category. The maintenance costs too were quite low. And with the mileage of 21-22 kmpl they wouldn’t have to worry about visiting the fuel station time and again. Even the normal customers were contented with the product, their only concern being – too many taxis of the same brand. And thus the number of Logan owners never grew (except in the taxi segment). With all this happening, Mahindra knew that it was time to strike back with this winner in hand. Now they were independent and wouldn’t need Renault’s approval to carry forward on their plans. Hence on the basis of extensive research, they brought up a 360 degree marketing campaign on customer testimonials. They are now focused to project their biggest advantages – i.e. Space and Mileage. They have also cut the prices upto Rs. 80,000 which makes it on-par with competition in terms of price. Now the question that emanates here is – “Does India love Logan?”. I say, Logan’s potential is yet to be tapped and currently Indians do not have the liking on Logan which can give it a blockbuster success. But, with the reinforced communication campaign, Mahindra has set its foot on the right track. If it could build up on this communication and bring some facial changes in the product, I’m sure Mahindra’s cash registers would start ringing again with Logan. And yes, then we would also proudly say that “India Loves Logan”..! Cars & Fashion goes hand in hand !!! Cars have always taken a special place in our Heart. For some it’s aspiration, for others it just a mode of transportation, some regard it as a living companion and the remaining take it as a style statement/personal embodiment. A friend of mine recently said that even car has human like characteristics and that clicked me the reason behind the recent trend behind car advertisements. We know that we factorize a car based primarily on its looks and performance; but more important than that is the marketing communiqué behind it. What are the adjectives that come to your mind when you think about Ferrari..? Maybe it’s Mean, Fast, Luxurious, Sporty and Elegant machine? But, have you ever driven a Ferrari, maybe not. India as an automobile market has become mature and people are overcoming from the utilitarian funda and have become more conscious in their choices. We couldn’t have thought more than a Splendor in motorcycle or Maruti 800 in car segment. But times have changed; Maruti has decided to stop the production of its 800 model from 2011 and also has started to give maximum focus on its car designs. This could be derived from the edgy design of A star, curvy and imposing look of Ritz and has even done a facelift of its popular Wagon-R (hope it transforms to be the blue-eyed boy of Indian car lovers!!). Something similar could be said about Mitsubishi Outlander. Hindustan Motors signed in the ace Fashion Designer Rohit Bal to position their SUV as a veritable fashion icon which they thought was something unique. And did Outlander catch the necessary eyeballs? Yes, the 360 degree campaign associated with it did more than just catching the eye. It attracted instant attention which further led to impressive word of mouth; and the commercial generated enough interest for it. I think the association between FASHION and CARS is here to stay; so don’t be surprised to see other fashion designers/photographers jump into the trend..! Nissan recently launched its small car Micra into the Indian Market. Nissan like any other auto manufacturer expects to gain from this segment of auto space. But, the question that arises here is, Has Nissan done enough to succeed in the Indian auto market? Will the brand “Nissan” prove to be a winner? Indian Auto Sector is utterly unpredictable. Even after lot of research, many auto manufacturers fail to make an impact. Take Mercedes-Benz as an example. It gained the advantage of early entry into the Indian market and was the market leader in the luxury car space; but BMW faltered Benz’s position in just half the time. BMW overtook Benz as the market leader. The segment now has extreme competition with products form Volkswagen (Passat, Phaeton), Audi (A & Q series), Nissan (Teana), and others… The liking of Indian public is very impulsive and has become very difficult to figure it out. This makes it very difficult for auto manufacturers to make out what its customers want. Just imagine Honda shipping Sarees to Japan…! No, it’s not to promote Indian culture, but used by Honda’s R&D center so that women can enter and exit the car with ease. Now lot of manufacturers are providing a set of special safety features considering the extreme Indian conditions (be it Road or Driving!). In some days we’ll see that ABS and Airbags will be a standard package in the car. The Indian versions of International cars already have a greater wheelbase. Nissan has said to understand the uniqueness of Indian Market and has thus launched Micra. It has started aggressive promotions and is getting good initial response. But the huge competition in this segment is worrying Nissan, as this is a very important bet; that is if they succeed they will be playing in numbers and instantly get recognition in this market, which in turn will allow them to leverage their other models. If failed; they would have to start from scratch making it extremely difficult for them to expand and meet their targets. Let’s look at the competition. Maruti Swift is the segment stalwart. But, many auto makers have experimented and tasted success. Chevrolet Beat, Ford Figo, Volkswagen Polo, Maruti Ritz, Hyundai i10 & i20, Fiat Punto – all have their loyal followers and are doing good in the market. It’s the competition of space and price; i.e. who’ll prove to provide the best value – be it in terms of Luxury, Space, Mileage and Price. Nissan is not a well known brand in India; hence it’s very challenging to persuade the customers to buy its product. And less Service Center numbers will add to Nissan’s woes. Even Fiat had to partner with Tata to promise a better service delivery. Chevrolet’s Beat is selling in great numbers as Chevrolet has improved its Service in last 5 years and is also leveraging on the confidence it got after successfully selling Spark in the small car segment. Nissan has also roped in Ranbir Kapoor to represent the brand. The explanation to this being the mass appeal and uber cool charm of his. The ads have already hit the television screens and have gathered mix responses. Nissan is aggressively promoting its luxury features (keyless entry and start); a feature found on luxury cars where you can keep the key fob in your pocket and press a button to start the car. But on the larger side of the picture I feel; Nissan Micra won’t be able to break the ice in the Indian market for Nissan. And along with just a dozen dealers Nissan wouldn’t be able to fit in the demand of the Indian Customers.